Department of Chemical Sciences 1, Biochemistry Unit, Afe Babalola University Ado-Ekiti, Ekiti State, Nigeria. Department of Biochemistry 2, Ekiti State University, Ado-Ekiti, Ekiti State, Nigeria. Department of Physiology, College of Medicine and Health Sciences 3, Afe Babalola University Ado-Ekiti, Ekiti State, Nigeria. ABSTRACT: Purpose: Dichlorvos (DDVP) causes toxicity in animals including humans. Alstonia boonei stem bark is widely used as a culinary medicine in the Ayurvedic system of medicine, possessing a number of pharmacological properties. This study was designed to evaluate the effect of Alstonia boonei (AB) against dichlorvos induced nephrotoxicity in Wistar rats. Methods: Dichlorvos (50 mg/kg body weight) was orally administered in Wistar rats for 14 days followed by the treatment of Alstonia boonei (200 and 400 mg/kg body weight) for 14 days. Changes in the kidney biochemical marker namely, glutathione (GSH), superoxide dismutase (SOD), catalase (CAT), aminotransferase (ALT), aspartate aminotransferase (AST) activities and levels of malondialdehyde (MDA), urea, and creatinine in the serum were estimated. Histological examinations of the kidney were monitored. Results: Exposure to dichlorvos lowered activities of kidney antioxidants, while it increased LPO levels. Levels of all disrupted parameters were alleviated by co-administration of AB extract. The malondialdehyde concentration of the rats treated with 200 and 400 mg/kg body weights of the extract significantly decreased (p<0.05) when compared with the untreated dichlorvos rats. But the creatinine concentration decreased significantly (p<0.05) when 200 and 400 mg/kg body weights of the extract of the treated dichlorvos animals were compared with the dichlorvos control. Furthermore, histological alterations in the kidney were observed in dichlorvos untreated rats and were ameliorated in dichlorvos-induced treated rats with Alstonia boonei. Conclusion: In conclusion, the results indicated that dichlorvos showed a protective effect on dichlorvos induced nephrotoxicity. INTRODUCTION: Organophosphate (OP) pesti-cides are among the most widely used synthetic chemicals for controlling a wide variety of pests. The main target of OP pesticides is acetylcholinesterase (AChE) which hydrolyzes acetylcholine in cholinergic synapses and neuromuscular junctions 1. Pesticides are chemicals used to control the insects/pests in agriculture, household, and public health programmes. Indiscriminate uses of pesticides have led to a serious risk of toxicity in animals including humans. Dichlorvos (DDVP) is an organophosphate pesticide used to protect greenhouse plants, fruits and vegetables against mushroom flies, aphids, spider, mites, caterpillars, thrips, and whiteflies. It is also used to treat a variety of parasitic worm infections in livestock, dogs, and humans. Dichlorvos is reported to cause toxicity of the reproductive system, 2 pancreas 3, kidney and spleen 4, brain 5, 6, and immune system 7. Pesticides are believed to damage the lipoidal matrix in the cell, generating reactive oxygen species (ROS) and promoting oxidative stress. The lipophilicity of organophosphate insecticides favor their incorporation in membranes. Therefore, insecticides may result from physicochemical changes at the level of membrane lipid structure and organization 8, 9. Endogenous non-enzymatic (glutathione, GSH) and enzymatic (superoxide dismutase (SOD), catalase (CAT) and glutathione peroxidase (GPx)) antioxidants detoxify these ROS and protect cells. Due to continuous exposure of pesticides, the level of these endogenous antioxidants decreases, leading to accelerated cell death. Use of cytoprotective agents in the form of exogenous antioxidants may help in scavenging excess ROS, helping in cell survival and longevity. Some medicinal plants are reported to possess ROS scavenging and cytoprotective activity 10-13. Alstonia boonei De Wild. is a large deciduous evergreen tree, usually up to 45 m tall and 1.2 m in diameter, belonging to the family Apocynaceae consisting of about 40-60 species. It is a native of tropical and subtropical Africa, Southeast Asia, Central America, and Australia. ‘Alstonia’ named after Dr. C. Alston (1685-1760), a Professor of Botany at Edinburgh University. Its reported for treatment of malaria, intestinal helminths, rheumatism, muscular pain, insomnia, and hypertension. It contains phytochemicals such as saponin, alkaloids, tannins and steroids 14, 15. Although, medicinal importance of stem bark extract of A. boonei in ameliorating some disease conditions reported by several authors, however, to the best of our knowledge, there is lack of information on the effect of this plant on its neuroprotective potentials. A. boonei has been shown to possess many pharmacological and physiological activities such as antioxidants 16. The increasing use of dichlorvos interested the researchers in reducing the damages caused for this class of pesticides in the environment. This stimulated us to examine the potential protective effect of Alstonia boonei extract on dichlorvos-induced nephrotoxicity in albino rats. Chemicals: Dichlorvos (2, 2-dichlorovinyl dimethyl phosphate – DDVP) was bought from a local chemist in Ibadan, Nigeria. Thiobarbituric acids (TBA) were bought from Aldrich Chemical Co. (Milwaukee, WI, USA). Glutathione, hydrogen peroxide, 5, 5’-dithios-bis-2-nitrobenzoic acid (DNTB) and Epinephrine bought from Sigma Chemical Co., Saint Louis, MO USA. Trichloroacetic acid (TCA) and Thiobarbituric acid (TBA) was bought from British Drug House (BDH) Chemical Ltd., Poole, UK. Other reagents were of analytical grade and the purest quality available. Collection and Extraction of Alstonia boonei Stem Bark: The stem bark of Alstonia boonei was procured from local suppliers in Ado-Ekiti (Ekiti State) and authenticated at the Department of Plant Science, Ekiti State University. The stem bark of Alstonia booneiair-dried and crushed into fine powder. The powdered part extracted with ethanol using maceration and the extract concentrated in vacuum at 40 ºC with a rotary evaporator and water bath to dryness. The yield of the extraction was 5.01%. Preliminary Phytochemical Screening: The preliminary phytochemical screening was carried out with ethanolic extracts of Alstonia boonei stem bark for the detection of various phytochemicals. Tests for common phytochemicals were carried out by standard methods 17. Animals: Male Wistar rats (Rattus norvegicus) weighing between 80-120 g bought from the animal house of the Department of Chemical Sciences, Biochemistry Unit, Afe Babalola University, Nigeria. Animals kept in aired cages at room temperature (28-30 ºC) and preserved on normal laboratory chow (Ladokun Feeds, Ibadan, Nigeria) and water ad libitum. Ethical Approval: Rats handling and treatments conform to guidelines of the National Institute of Health (NIH publication 85-23, 1985) for laboratory animal care and use. The ethical committee of the Afe Babalola University approved this study. All animals in this study follow the Institutional Animal Ethical Committee according to guidelines given by the Committee for Control and Supervision of Experiments on animals (CPCSEA). Induction of Nephrotoxicity and Drug Feeding Schedule: Dichlorvos induced in groups II, III and IV. Briefly, dichlorvos dissolved in distilled water and after that managed by intravenous injection (through a tail vein) at a dose of 50 mg/kg body weight. Study Design: Twenty male rats divided into four groups of five rats each. Group I- Control (distilled water); Group II- Dichlorvos (50 mg/kgb.w. ); Group III – Alstonia boonei (200 mg/kg b.w.) (14 days) + DDVP (50 mg/kg b.w. ); Group IV- Alstonia boonei (400 mg/kg b.w.) (14 days) + DDVP (50 mg/kg b.w.). Preparation of Tissue Homogenate: Kidney tissues were quickly removed, washed in ice-cold, isotonic saline, and blotted individually on ash-free filter paper. The tissues were then homogenized in 0.1M 2-amino-2-(hydroxymethyl)-1,3-propane-diol hydrochloride buffer, pH 7.4 using a Potter-Elvehjem homogenizer at 4 °C, the crude tissue homogenate was then centrifuged at a speed of 9000 rpm for 15 min in cold centrifuge, and the supernatant was kept at -20 °C for estimation of GSH, SOD and CAT activities. Preparation of Serum: Blood collected from the heart of the animals into plain centrifuge tubes and allowed to stand for 1 h. Serum prepared by centrifugation at 3,000 for 15 min in a Beckman bench centrifuge. The clear supernatant used for estimating serum lipid profile and enzymes. Biochemical Tests: Protein contents of the samples tested by the method of 18 using bovine serum albumin as standard. The alanine and aspartate aminotransferases (ALT and AST) tested by the combined methods of 19 and 20. Lipid peroxidation level was tested by the reaction between 2-thiobarbituric acid (TBA) and malondialdehyde (MDA), a product of lipid peroxides as described by 21. The tissue superoxide dismutase (SOD) measured by the nitro blue tetrazolium (NBT) decrease method of 22. Catalase (CAT) tested spectrophotometrically by measuring the rate of decomposition of hydrogen peroxide at 240 nm as described by 23. Reduced glutathione level by the method of 24 this method is on developing a stable (yellow) color when 5’, 5’-dithiobis- (2-nitrobenzoic acid) (Ellman’s reagent) mix to sulfhydryl compounds. The chromophoric product resulting from Ellman’s reagent with the reduced glutathione (2-nitro-5-thiobenzoic acid) holds a molar absorption at 412 nm which is part of the reduced glutathione in the test sample. The glutathione peroxidase (GPx) tested by the method of Beutler E et al. 25 When this substance is mixed with reduced glutathione, its absorption shifts to a longer wavelength of 340 nm and increase at this wavelength provides a direct measurement of the enzymatic reaction. Determination of Serum Urea Concentration: Urea concentration in the blood was estimated by enzymatic method using Urease enzyme kit by modified Berthelot method 26. Absorbance was measured using UV-240 Vis spectrophotometer. Determination of Serum Creatinine Concentration: Creatinine level in serum was estimated by the alkaline picrate method using creatinine kit method 26. Absorbance was measured from UV-240 Vis spectrophotometer. Histopathology of Tissues: The kidney was removed and fixed in Bouin's fluid. Fixed materials were embedded in paraffin wax, and sections of 5 micrometers thickness were cut. Slides were stained with hematoxylin and eosin for histological examination. Statistical Analysis: All the data are expressed in mean ± SEM. The significance of the difference in means between control and treated animals was determined by One-way analysis of variance (ANOVA) followed by the Duncan multiple range test for analysis of biochemical data using SPSS (16.0). Values considered statistically significant at p<0.05. Phytochemicals Investigation: It was found that ethanolic extract contained compounds known to have an antioxidant activity like tannins, phlobatannins, flavonoids, anthocyanin, cardiac glycosides and alkaloids Table 1. Effects of Alstonia boonei Stem Bark on Body Weight and Relative Weight of Organs of Dichlorvos-Induced Nephrotoxicity in Rats: In Table 2, there was significant increases (p<0.05) in the relative weight of kidney of dichlorvos untreated rats when compared with the control, while treatment with Alstonia boonei stem bark (100 and 200 mg/kg) significantly decrease the relative weight of kidney of dichlorvos-induced rats to values that statistically similar (p>0.05) to the control. All these changes induced by dichlorvos intoxication significantly (p<0.05) restored to near normal levels on the administration of Alstonia boonei stem bark. Values are means ± S.D. of 5 animals per group, dichlorvos = at 50 mg/kg, dichlorvos Treated = Alstonia boonei at 200 mg/kg, dichlorvos treated = Alstonia boonei at 400 mg/kg, *significantly different from Control (p<0.05), **significantly different from dichlorvos untreated (p<0.05). Effects of Alstonia boonei Stem Bark on Antioxidant Parameters and Marker Enzymes in Dichlorvos-Induced Nephrotoxicity In Rats: Administration of dichlorvos significantly increased (p<0.05) serum, and kidney lipid peroxidation (LPO) products measured as thiobarbituric acid reactive substances respectively Table 3. However, treatment with Alstonia boonei extract completely ameliorated dichlorvos-induced increase in LPO. In dichlorvos-induced rats, the activities of kidney GSH, SOD and CAT as well as GPx decreased significantly relative to the control Table 4. Values are means ± S.E.M. of 5 animals per group, dichlorvos Treated = Alstonia boonei at 200 mg/kg, dichlorvos treated = Alstonia boonei at 400 mg/kg, *significantly different from control (p<0.05), ** significantly different from dichlorvos untreated (p<0.05). Excellent performance of extract at (400 mg/kg) reversed the adverse effect of dichlorvos by normalizing this enzymic antioxidant. Alstonia boonei treatment to dichlorvos treated groups caused a significant increase in GPx activities as well as a noticeable increase in GSH level. In dichlorvos-induced rats, serum ALT and AST were significantly increased Table 5 relative to the control. Treatment with Alstonia boonei resulted in significant protection of the kidney, as indicated by reductions in the elevated levels of ALT and AST; however, there was evidence of amelioration in the treated group. Values are means ± S.E.M. of 5 animals per group, dichlorvos untreated group = at 50 mg/kg dichlorvos Treated = Alstonia boonei at 200 mg/kg, dichlorvos treated = Alstonia boonei at 400 mg/kg, *significantly different from control (p<0.05), ** significantly different from dichlorvos untreated (p<0.05). Effects of Alstonia boonei Stem Bark on Serum Protein, Urea and Creatinine in Dichlorvos-Induced Nephrotoxicity in Rats: There was a significant decrease in the levels of serum total protein in the dichlorvos group when compared with the control group Table 6. However, levels of this compound in the serum were significantly increased in dichlorvos treated groups when compared with the dichlorvos control group. Levels of urea and creatinine in the serum of the dichlorvos group were significantly increased when compared with the control group Table 6. However, levels of serum urea and creatinine were significantly decreased in dichlorvos treated groups when compared with the dichlorvos group. The ameliorative effect treatment of Alstonia boonei on the levels of serum urea and creatinine was more prominent. 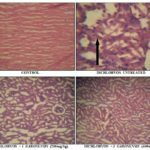 Effects of Alstonia boonei Stem Bark on the Histology of Kidney: The histology of kidney slide of dichlorvos untreated rats showed mononuclear cell infiltration, mild spongiosis, severe congestion and glomerular atrophy Fig. 1. Treatment with ethanolic extract of stem bark Alstonia boonei (200 and 400 mg/kg) confirmed the nephroprotective activity as a significant recovery of damage and decreased necrosis was evident against dichlorvos induced oxidative damage in the kidney of the rats, which is similar to their control. The histological results further corroborated the biochemical findings suggesting the useful effects of Alstonia boonei stem bark in dichlorvos-induced nephrotoxicity in rats. DISCUSSION: Dichlorvos is one of the environmental pollutants which showed a broad spectrum toxicological effects and biochemical dysfunctions constituting serious hazards to health. Histological examination of the kidney of dichlorvos-intoxicated rats revealed many alterations such as tubular degeneration, atrophy of glomeruli, leucocytic infiltrations and congestion of renal blood vessels. Pesticides cause various histopathological changes in kidney tissues of experimental animals 27, 28, 29, 30. 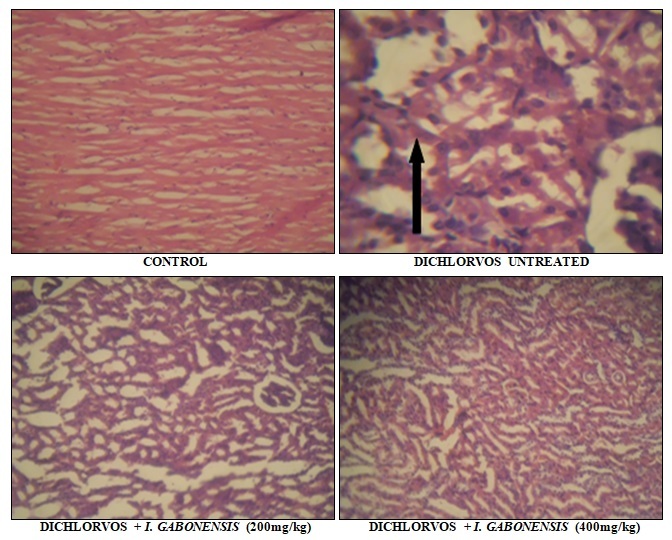 Regarding the histopathological observation, Alstonia boonei treated dichlorvos induced nephrotoxicity rats the observed pathological impairments by dichlorvos have been recovered significantly which indicates that Alstonia boonei is capable of preventing the nephron damage induced by dichlorvos. The phytochemical study of Alstonia boonei stem bark extracts revealed the presence of polyphenol-rich compounds. Polyphenols have been suggested to decrease the oxidative stress in a human. Flavonoids found in the extract may inhibit the oxidative stress by scavenging free radicals by acting as reducing agent, hydrogen atom donating molecules or singlet oxygen quenchers; chelating metal ions and sparing other antioxidants (e.g., carotene, vitamin C and E) 31. Literature reveals that the carbonyl groups present in the flavonoids and phenolic compounds were responsible for antioxidant activity 32. This investigation revealed that the Alstonia boonei contain pharmacologically active substance (s) such as alkaloids, glycosides, saponins, tannins, flavonoids and phenolic compounds, which are responsible for the antioxidant activity. A literature survey indicates that there is no scientific evidence to support the nephroprotective effect of ethanolic extract of A. boonei. Therefore, the present study is undertaken to investigate nephrotoxicity effect of dichlorvos and the effects of A. boonei ethanol leaf extract in ameliorating it. In dichlorvos induced rats treated with Alstonia boonei, the changed body weight and kidney weight parameters recovered to near normal levels due to the antioxidant effects of finding in Alstonia boonei stem bark. A. boonei has been shown to possess many pharmacological and physiological activities such as antioxidants 16. Hence, the probable mechanism of nephroprotection by Alstonia boonei may be attributed to its antioxidant and free radical scavenging property. Administration of dichlorvos resulted in a significant increase in the renal content of MDA indicating increased lipid peroxidation which implicates the renal oxidative stress. Moreover, dichlorvos caused a significant decrease in the activities of SOD and CAT. Antioxidant enzymes, mainly SOD and CAT are the first line of defense against free radical-induced oxidative stress. SOD is responsible for the catalytic dismutation of highly reactive and potentially toxic superoxide radicals to hydrogen peroxide, and CAT is responsible for the catalytic decomposition of hydrogen peroxide to molecular oxygen and water 33. A decrease in the level of antioxidant enzymes and an increase in lipid peroxidation level were recorded after dichlorvos intoxication 34, 35, 36. Damage of renal tissue observed in the present study may result from the increase in lipid peroxidation and a decrease of antioxidant enzymes in the kidney following exposure to dichlorvos. Dichlorvos exposure leads to decrease in GPx activity in our study, which may be due to the depleted level of GSH. A decrease in SOD, CAT, and GPx depletion was significant in the dichlorvos untreated group indicating that dichlorvos induced nephrotoxicity. In treatment groups, Alstonia boonei showed protective role by decreasing the LPO level in animals exposed to dichlorvos. Alstonia boonei worked as an antioxidant and increased the level of non-enzymatic antioxidant GSH, enzymatic antioxidants CAT, SOD, and GPx, and the AST and ALT in animals exposed to dichlorvos. Alstonia boonei reduces the oxidative stress in the animals, by its high ROS scavenging capacity and protecting the antioxidant enzymes from being denatured. Well, known biomarkers (ALT and AST) were examined to evaluate the nephroprotective effects of Alstonia boonei. Consistent with previous studies, our study confirmed that dichlorvos exposure damaged the kidney, as shown by the elevation of the serum aminotransferase activities and morphological changes observed in the kidney sections. Many pesticides can cause some toxic and adverse effects on the kidney tissues 37. The kidney is one of the targets organs of experimental animals attacked by organophosphate compounds 38, 39. Urea, uric acid, and creatinine levels are kidney function parameters 38, 40. Pesticides can alter plasma urea, and creatinine levels 38, 41, 42. In this study, dichlorvos exposure increased in the urea and creatinine levels when compared to control rats. This increase may be due to kidney damage caused by dichlorvos. Urea is the end product of protein catabolism. Increased blood urea is correlated with increased protein catabolism in the mammalian body and referred to kidney dysfunction 42, 43. The levels of urea in the plasma of rats are tested as indicators for kidney functions 44. Also, the high levels of blood urea results caused by the increased breakdown of tissue or impaired excretion 42. In this study, this increased urea level is due to toxic effects of dichlorvos. The creatinine excretion is dependent almost on the process of glomerular filtration. The previous study reported that a significant rise in the serum creatinine level might be due to the impairment of the glomerular function and tubular damage in the kidneys 38. Creatinine level is a good risk marker for chronic renal insufficiency 41, 45. Increased creatinine level shows that damage of the glomerular function and tubular damage in the kidneys 46, 47. The obtained results in the current study showed that the ethanol extract of Alstonia boonei had a protective effect against dichlorvos induced kidney damage. This was obvious as there was a significant decrease in urea and creatinine levels in the Alstonia boonei treated group when compared with the dichlorvos group. To conclude, our studies have shown that the entire plant of Alstonia boonei, possesses marked nephro-protective activity and thus has a promising role in the treatment of acute renal injury induced by nephrotoxins, especially dichlorvos (DDVP). CONCLUSION: It can be concluded that our studies have shown that ethanolic extract of Alstonia boonei possesses marked nephroprotective activity which is already reported in the literature. Further, isolation of active components and its nephroprotective activity in chronic renal failure model have to be evaluated. ACKNOWLEDGEMENT: The Authors wish to recognize the Department of Chemical Sciences, Biochemistry Unit, Afe Babalola University, Ado-Ekiti, where the research conducted. Verma RS, Mehta A and Srivastava N: Comparative studies on chlorpyrifos and methyl parathion induced oxidative stress in different parts of rat brain: Attenuation by antioxidant vitamins. Pestic Biochem Phys 2009; 95: 152-158. Joshi SC, Mathur R, Gajraj A and Sharma T: Influence of methyl parathion on reproductive parameters in male rats. Environ Toxicol Pharmacol 2003; 14: 91-8. Hagar HH and Fahmy AH: Biochemical, histochemical, and ultrastructural evaluation of the effect of dimethoate intoxication on rat pancreas. Toxicol Lett 2002; 133: 161-70. Verma RS and Srivastva N: Effect of chlorpyrifos on thiobarbituric acid reactive substances scavenging enzyme and glutathione in Rat Tissues. Indian J Biochem Biophysics 2003; 40: 423-8. Mogda K, Afaf AIM, El-Kashoury MA, Rashed KM and Koretem KM: Oxidative and biochemical alterations induced by profenofos insecticide in rats. Nat Sci 2009; 7: 1-15. Diwivedi N, Bhutia YD, Kumar V, Yadav P, Kushwaha P and Swarnkar H: Effects of combined exposure to dichlorvos and monocrotophos on blood and brain biochemical variables in rats. Hum Exp Toxicol 2010; 29: 121-9. Neishabouri EZ, Hassan ZM, Azizi E and Ostad SN: Evaluation of immunotoxicity induced by diazinon in C57bl/6 mice. Toxicology 2004; 196: 173-9. VideiraRA, Antunes-Maderia MC, Lopes VICF and Madeira VMC: Changes induced by malathion, methyl parathion and parathion on membrane lipid physico-chemical properties corralate with their toxicity. Biochim Biophys Acta 2011: 1511: 360-368. Ogutcu A, Suludere Z and Kalender Y: Dichlorvos-induced hepatotoxicity in rats and the protective effects of vitamins C and E. Environ Toxicol Pharm 2008: 26: 355-361. Anilakumar KR, Saritha V, Khanum F and Bawa AS. Ameliorative effect of ajwain extract on hexachlorocyclohexane-induced lipid peroxidation in rat liver. Food ChemToxicol. 2009; 47:279–82. Rafat SA, Suke SG, Seth V, Chakraborti A, Tripathi AK and Banerjee BD: Protective effects of dietary ginger (Zingiber officinales) on lindane-induced oxidative stress in rats. Phytother Res 2008; 22: 902-6. Umamaheswari BM and Chatterjee TK: Effect of the fractions of Coccinia grandis on ethanol-induced cerebral oxidative stress in rats. Pharmacol Res 2009; 1: 25-34. Venkatesan P, Satyan KS, Sudheer KM and Pakash A: Protective effect by aqueous extract of Phyllanthus amaruslinn; phyllanthin and nirocil against carbon tetrachloride-induced liver and brain toxicity. Indian J Pharma Sci 2003; 65: 309=12. Taiwo OB, Kroes BH, Beukelman CJ, Horsten S, Horsten S, Horsten S, Makinde JM and Labadie RP: The activity of the stem bark extract of Alstonia boonei de Wild (Apocynaceae) on human complement and A polymorphonuclear leukocytes. Ind J Pharmacol 1998; 30: 169-174. Osadebe PO: Anti-inflammatory properties of the root bark of Alstonia boonei. Nig J Nat Prdt Med 2002; 6: 39-41. Akinmoladun AC, Ibukun EO, Afor E, Akinrinola BL, Onibon TR, Akinboboye AO, Obuotor EO and Farombi EO: Chemical constituents and antioxidant activity of Alstonia boonei. Afr J Biotechnol 2007; 6(10): 1197-1201. Srinivasan R, Chandrasekar MJN, Nanjan MJ and Suresh B: Antioxidant activity of Caesalpinia digyna J Ethnopharmacol. 2007; 113: 284-291. Lowry OH, Rosebrough NJ, Farr AL and Randall RJ: Protein measurement with the Folin phenol reagent. Journal of Biological Chemistry 1951; 193: 265-275. Mohun AF and Cook LJ: Simple method for measuring serum level of glutamate-oxaloacetate and glutamate-pyruvate transaminases in laboratories. Journal of Clinical Pathology 1957; 10 (4): 394-399. Reitman S and Frankel S: A colorimetric method for the determination of serum level of glutamate-oxaloacetate and pyruvate transaminases. American Journal of Clinical Pathology 1957, 28(1): 56-63. Buege JA and Aust SD: Microsomal lipid peroxidation. Methods in Enzymology 1978; 52: 302-310. McCord JM and Fridovich I: Superoxide dismutase, an enzymatic function for erythrocuprein. Journal of Biological Chemistry 1969: 244(22): 6049-6055. Aebi H: Catalase estimation: Methods of enzymatic analysis. In Bergmeyer HV (ed), Verlag Chemic 1974; 673-684. Beutler E, Duron O and Kellin BM: Improved method for the determination of blood glutathione. The Journal of Laboratory Clinical Medicine 1963; 61: 882-888. Rotruck JT, Pope AL, Ganther HE, Swanson AB, Hafeman DG and Hoekstra WG: Selenium: biochemical role as a component of glutathione peroxidase. Science 1973; 179(4073): 588-590. Harold V: Practical Clinical Biochemistry. William Heinemann Medical Books, 5th, 1980: 1: 451-596. Kalender S, Kalender Y, Durak D, Ogutcu A, Uzunhisarcikli M, Cevrimli BS and Yildirim M: Methyl parathion induced nephrotoxicity in male rats and the protective role of vitamins C and E. Pestic Biochem Phys 2007; 88: 213-218. Elhalwagy MEA, Darwish NS and Zaher EM: Prophylactic effect of green tea polyphenols against liver and kidney injury induced by fenitrothion insecticide. Pestic Biochem Phys 2008; 91: 81-89. Mohnsen M: Biochemical and histopathological changes in serum creatinine and kidney induced by inhalation of thimet (phorate) in male Swiss albino Mouse, Mus musculus. Environ Res 2001; 87: 31-36. Sulak O, Altuntas I, Karahan N, Yildirim B, Akturk O, Yilmaz HR and Delibas N: Nephrotoxicity in rats induced by organophosphate insecticide methidathion and ameliorating effects of vitamins E and C. Pestic Biochem Phys 2005; 82: 21-28. Fuhrman B and Aviram M: Flavonoids protect LDL from oxidation and attenuate atherosclerosis. Current Opinion in Lipidology 2001; 12: 41-48. Sajeesh T, Arunachalam K and Parimelazhagan T: Antioxidant and antipyretic studies on Pothos scandens Asian Pac J Trop Med 2011; 4(11): 889-899. Lee KW, Jeong YJ, Lim BJ, Chang YK, Lee SJ, Na KR, Shin YT and Choi DE: Sildenafil attenuates renal injury in an experimental model of rat cisplatin-induced nephrotoxicity. Toxicology 2009; 257: 137-143. Sayeed I, Parvez S, Pandey B, Hafeez R, Haque S and Raisuddin S: Oxidative stress biomarkers of exposure to deltamethrin in freshwater fish, Channapunctata Bloch. Ecotox Environ Saf 2003; 56: 295-301. Rehman H, Ali M, AtifF, Kaur M, Bhatia K and Raisuddin S: The modulatory effect of deltamethrin on antioxidants in mice. Clinic Chemic Acta 2006; 369: 61-65. Mokhtar I, Yousef A, Talaat I and Edriss H: Deltamethrin-induced oxidative damage and biochemical alterations in rat and its attenuation by vitamin E. Toxicol 2006; 227: 240-247. Mansour SA and Mossa AH: Oxidative damage, biochemical and histopathological alterations in rats exposed to chlorpyrifos and the antioxidant role of zinc. Pestic. Biochem. Phys 2010; 96: 14-23. Sivapiriya V, Jayanthisakthisekaran J and Venkatraman S: Effects of dimethoate (o,O-dimethyl S-methyl carbamoyl methyl phosphorodithioate) and ethanol in antioxidant status of liver and kidney of experimental mice. Pestic Biochem Phys 2006; 85: 115-121. Yeh YH, Lee YT, Hsieh HS and Hwang DF: Effect of taurine on the toxicity of vitamin A in rats. Food Chem 2008; 106: 260-268. Yearout R, Game X, Krumpe K and McKenzie C: Impacts of DBCP on participants in the agricultural industry in a third world nation (industrial health, safety case study of a village at risk). Int J Ind Ergonom 2008; 38: 127-134. Yousef MI, Awad TI and Mohamed EH: Deltamethrin-induced oxidative damage and biochemical alterations in rat and its attenuation by vitamin E. Toxicology 2006; 227: 240-247. El-Demerdash FM: Antioxidant effect of vitamin E and selenium on lipid peroxidation, enzyme activities and biochemical parameters in rats exposed to aluminum. J Trace Elem Med Bio 2004; 18: 113-121. Husain K, Whitworth C and Rybak LP: Time response of carboplatin-induced nephrotoxicity in rats. Pharmacol Res 2004; 50: 291-300. Karahan I, Atessahin A, Yilmaz S, Ceribasi AO and Sakin F: Protective effect of lycopene on gentamicin-induced oxidative stress and nephrotoxicity in rats. Toxicology 2005; 215: 198-204. Mora LO, Antunes LMG, Francescato HDC and Bianchi MLP: The effects of oral glutamine on cisplatin-induced nephrotoxicity in rats. Pharmacol Res 2003; 47: 517-522. Ojo AO, Oyinloye BE, Ajiboye BO, Ojo AB, Akintayo CO and Okezie B: Dichlorvos induced nephrotoxicity in rat kidney: protective effects of Alstonia boonei stem bark extract. Int J Pharmacognosy 2014; 1(7): 429-37. doi: 10.13040/IJPSR.0975-8232.1(7).429-37. Authors Address: Department of Chemical Sciences, Biochemistry Unit, Afe Babalola University Ado-Ekiti, Ekiti State, Nigeria.